Since 1995, Andrew York, the son of Sergeant Alvin C. York and his wife, Gracie, has been giving tours of the family home in Pall Mall, where the Wolf River flows off the Cumberland Plateau. When visiting the park and homeplace you will also be able to visit the Gristmill, museum, homeplace, General Store, Interpretive Center, playground, picnic area, gravesite and bible school. You will start visit at the York General Store & Interpretive Center. Please contact us to obtain information and schedule your tour today! 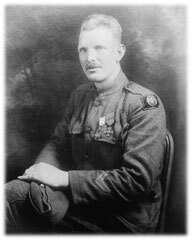 PALL MALL, Tenn. - On a hot summer day, a couple from Kentucky pull off U.S. Highway 127 to visit the home of Alvin C. York, the decorated World War I hero who single-handedly captured 132 prisoners in a famous firefight against the German Army in France. Before leaving, the couple ask if they can have their picture taken with their tour guide, a tall, broad-shouldered man who bears a striking resemblance to the black-and-white photographs of his father hanging on the wall. For the past 14 years, Andrew York, the 79-year-old son of Alvin C. York and his wife, Gracie, have been giving tours of the family home in Pall Mall, where the Wolf River flows off the Cumberland Plateau. The house, as well as the nearby grist mill and post office/general store, are part of Sgt. Alvin C. York State Historic Park. When Andrew York goes to work, he wears a ranger's uniform. The tour begins in the living room. A World War I German helmet rests on the mantle over the fireplace, and there's an upright piano against the wall. The house is two stories, with 10-foot ceilings and five bedrooms. The state of Tennessee built it for Sgt. York in 1922, three years after he returned from the war. The Yorks had 10 children, three of whom died at early ages. Born in 1930, Andrew York was the couple's fifth child. He was 34 years old when his father passed away Sept. 2, 1964, at age 76. "I was born in this house," Andrew York said. "We were all born here. Everything is like it was when we were growing up - the original carpet, the wallpaper, even the pictures hanging in the same location on the walls." He isn't the only family member who works at the state historic site. There's also Margaret York, Sgt. York's daughter-in-law, and Cletis York, York's nephew. The house didn't have running water or electricity until 1946. There are kerosene lamps in some of the rooms, as well as the homemade wooden crib Andrew York and his siblings slept in as babies. In one of the upstairs bedrooms is a jar containing Sgt. York's gall bladder, which he had removed in 1935. Andrew York remembers his father as strict, but loving. "I never saw him mad, and I never saw him talk about the war," he said. "We always had a house full of people. They'd come all the way from London to take his picture. He was always polite, but he dismissed all talk about the war." York's bedroom is on the first floor, the first room to the right. In 1954, after suffering a stroke, he received a state-of-the-art electric hospital bed from Buford Ellington, governor of Tennessee. The bed is still in the bedroom, along with York's wheelchair. Born in a one-room log cabin in Pall Mall, York enlisted in the U.S. Army in 1917 at age 30. On Oct. 18, 1918, his company was heading toward the front line in the Argonne Forest of France when they came under withering fire from German machine guns. Armed with a 1903 Springfield rifle and a Colt .45 pistol, York systematically picked off a number of the machine gunners. When seven Germans charged him with fixed bayonets, he stood his ground and shot them, too. When the German major offered a surrender in exchange for a cease-fire, York agreed, and found himself with some 132 prisoners. He received the Medal of Honor for his valor. Andrew assures visitors his father was every bit as good a marksman as they've been led to believe. "You could flush pigeons out the barn, and he'd hit them with a .22 rifle," he said. A devout Christian, York is said to have spent two days and two nights praying his conscience on top of a cliff overlooking the Wolf River Valley before shipping off to Europe to fight. Andrew York says this is true. He also says his father approved of the 1941 Oscar-winning film "Sergeant York," starring Gary Cooper. Andrew York loves to tell visitors how his father threw a fit when he caught Gary Cooper smoking a cigarette on the Hollywood set. "They had to shut down production until Gary Cooper apologized to Daddy," he said. In 1942, York used his share of the proceeds from the movie to start a Bible school in Pall Mall. He built the first general store and post office in town, and worked tirelessly to raise money needed to establish the Alvin C. York Institute, a public high school in Jamestown, Tenn.
Andrew said his father could have been a millionaire if he had accepted all the offers that came his way. "He wouldn't cash in on his fame," Andrew York said. "He used to say, 'Uncle Sam's uniform is not for sale.'" Sgt. York was 43 when Andrew was born. At one time, the house was home to 11 people, including Andrew, his wife, and their two children. "This house has seen a lot of love and laughter," he said. The Sgt. Alvin C. York State Historic Park is especially popular with school groups. Andrew York said he sometimes marvels at the fact that the remnants of his childhood are on public display and that his father's legacy lives on. "It's hard to find heroes like him anymore." he said. "Daddy thought more of other people than he did of himself. That was the type of person he was." The author, Morgan Simmons, may be reached at 865-342-6321. Please note: House tours are postponed until further notice due to restoration. All other park amenities are available and open as usual. Documentary "Over There, Over Here: Tennesseans in the Great War"
The documentary "Over There, Over Here: Tennesseans in the Great War," produced by WCTE Upper Cumberland PBS, highlights the Alvin C. York site and the Tennesseans who fought in World War I. To purchase a full-length DVD of this film, contact WCTE Upper Cumberland PBS at (931)528-2222. “Tennessee Crossroads” visits the Sergeant. 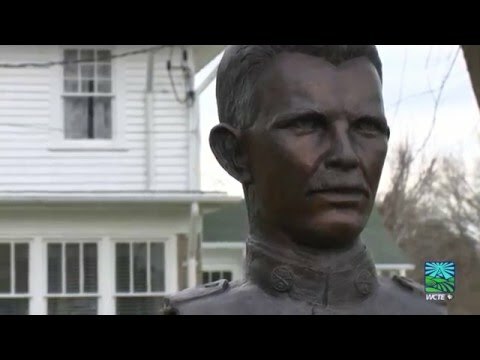 Alvin C. York State Historic Park, dedicated to the memory of the most decorated soldier in WWI. Visit www.tennesseecrossroads.org for more information about this story.